Welcome to Cleaning Unlimited. Our company is targeted towards serving small to large businesses. We currently service businesses throughout Stark and Summit counties. We assist our clients with all janitorial needs. We provide exceptional quality at reasonable rates. This website is intended to provide you a overview of our services. if you would like to make an appointment for a cleaning consultation, click here. You will find Cleaning Unlimited to be a professional, reliable, economical service. At Cleaning Unlimited, attention to detail is paramount. Customers are always impressed with how well we do our job. 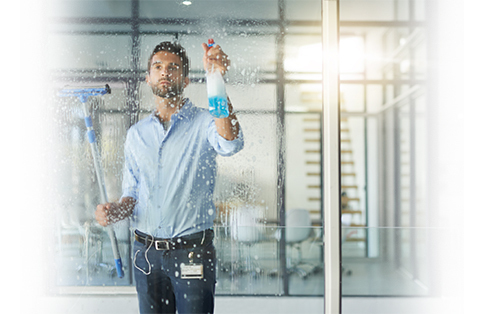 From cleaning your windows to cleaning your restrooms, we do our very best in keeping your business spotless. "Jacqueline is the best, she always makes sure our suite is clean and professional looking, from clean restrooms to sparkling windows, we want to put our best foot forward, and they help us do that, thank you! " "Cleaning Unlimited does a fantastic job with our office, the staff is very professional, trustworthy and takes pride in what they do. I am very happy with then and would recommend them to others." The team at Cleaning Unlimited is top-notch in my book. I come in on the weekends sometimes and I get to see first hand the quality work they do and attention to detail when it comes to cleaning everything. They are second-to-one, period."